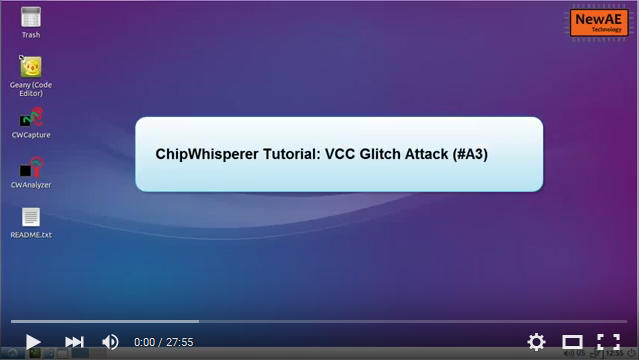 This advanced tutorial will demonstrate power glitch attacks using the ChipWhisperer system. The previous clock glitching tutorials looked into the assumption of a constant clock. But instead we can modify the voltage of the device, causing for example a failure to correctly read a memory location or otherwise cause havoc with the proper functioning. 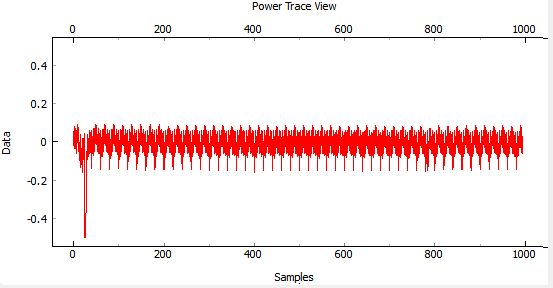 caption Top trace is the VCC (power) measured at the microcontroller pin, lower trace is the clock to the device. caption A zoom in of the previous figure, showing the offset between the clock and the glitches. caption Changing the offset means the glitches are ineffective - this requries considerable experimentation to discover the value for offset, glitch width, and number of glitches. For more details, please see Tutorial_A2_Introduction_to_Glitch_Attacks_(including_Glitch_Explorer), this tutorials assumes you have already performed the clock glitching tutorial. This tutorial will use the Glitch Explorer, which is described in the previous tutorial. The glitch generation hardware is the same as used in the clock glitching attack. The generated glitches are synchronous to the device clock, and inserted at a precise offset from the clock edge. This method allows use with the standard side-channel analysis development board, which has resistors inserted into the VCC lines already. The downside of this method is that it can only generate short glitches, since the power consumption through the shunt resistor will short out the resistor. 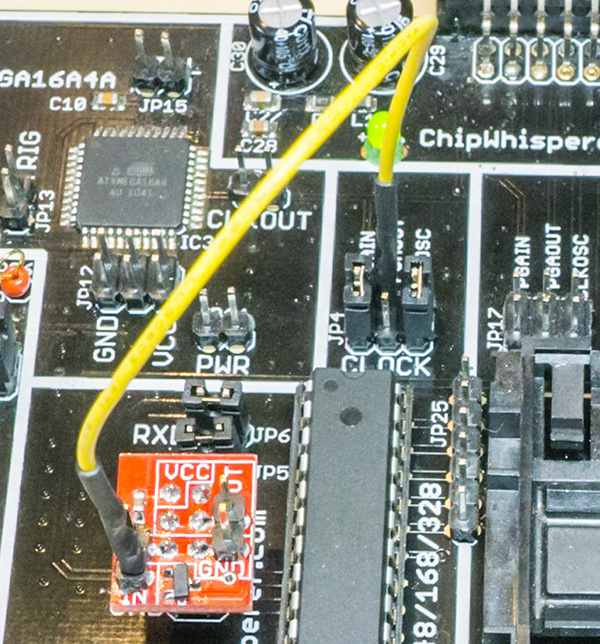 The MOSFET glitching hardware is built into the ChipWhisperer-Lite (both CW1173 and CW1180) board. The ChipWhisperer-Capture Rev2 uses an external VCC glitching board. The XMEGA target is currently not supported for this tutorial. The hardware is capable of being glitched, but we are still working on improving the reliability of the attack on the XMEGA. This section will be updated when details are available. SMA Cable from the Glitch port to the VCC shunt. 20-Pin Target Cable for Clock & Data. Optional: SMA Cable from the Measure port to the VCC shunt (can be used to monitor glitch insertion). If using a target with only a single SMA, only connect the Glitch port. The measure port is optional to allow you to monitor the VCC line as you are inserting the glitch. Connect the Glitch port to the VOUT pin. Connect the Measure port to the LNAIN pin. Add the jumper across JP21 to route the VOUT to the LNAIN. If using the ChipWhisperer Capture Rev2 (CW1002), you do not have a glitch output port. Instead you need the VCC glitching add-on. The VCC glitching add-on can be added to the AVR or SmartCard 6-pin headers, or connected to the XMEGA by a few additional jumper wires. An example of the connection is shown in the vccglitchhwsetup section. The connection between the glitch input and FPGAOUT pin must be done via a jumper wire. 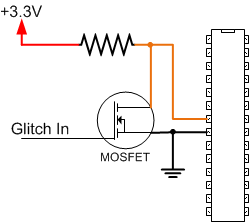 This connects the glitch module output to the MOSFET input, such that whenever a glitch is requested the VCC on the target is shorted. Note that the VCC glitcher is capable of being damaged or causing damage to the multi-target board. In particular the shunt resistor mounted on the VCC line (e.g. R1 for the AVR) is rated only for 0.1 watts. 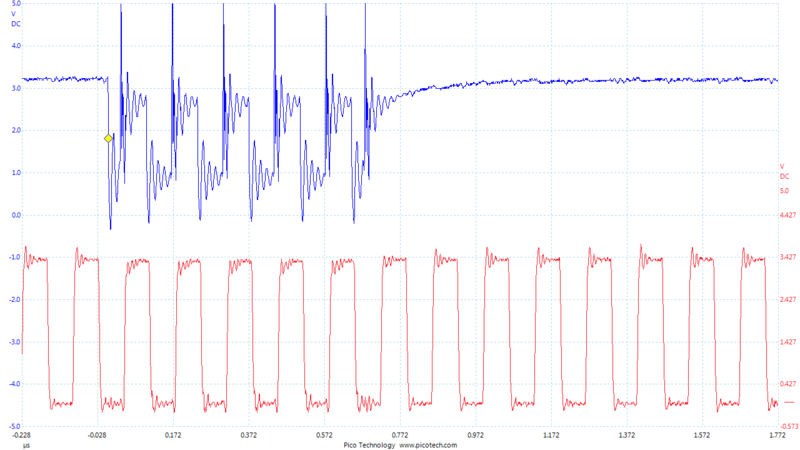 Shorting a 3.3V VCC to GND however causes 0.2 watts to be dissipated. Provided the glitch is only short-lived (as the glitches are for this system), the total average dissipation will not cause damage. If however the glitch module accidently caused a continous short of the VCC to GND, the power dissipation of the resistor may cause it to burn out. The hardware is almost as in previous incarnations. Note that unlike the Tutorial_A2_Introduction_to_Glitch_Attacks_(including_Glitch_Explorer) you do not connect the FPGAOUT to the AVR Clock, instead you use the 7.37 MHz oscillator bridged to both the AVR clock and FPGAIN. This is the same clock setup as in the side-channel power analysis tutorials. 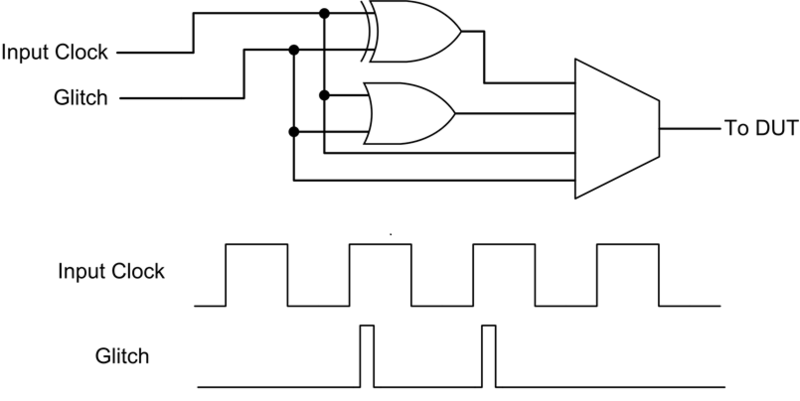 The following figure shows the clock jumper configuration, which are the same as the settings from Tutorial_B5_Breaking_AES_(Straightforward). caption The control line for the VCC glitcher board comes from the FPGAOUT pin. caption The VCC glitcher board must be mounted with GND at the bottom matching, exactly as shown here. Just as in the clock glitching example, you will be required to program the AVR microcontroller with an example you can glitch. Once again program in the glitch example code to use the glitch1() function, as described in Tutorial_A2_Introduction_to_Glitch_Attacks_(including_Glitch_Explorer). If using the AVR target, be sure to modify the makefile to select the new target type (i.e. if you previously targeted the XMEGA, that hex-file will not work on the NOTDuino). Programming the device is also described in Step #4 in the following section. Run connect on both the Scope & Target. They should both switch to green circles indicating the system is connected. Set the Desired Frequency to 7.37 MHz. 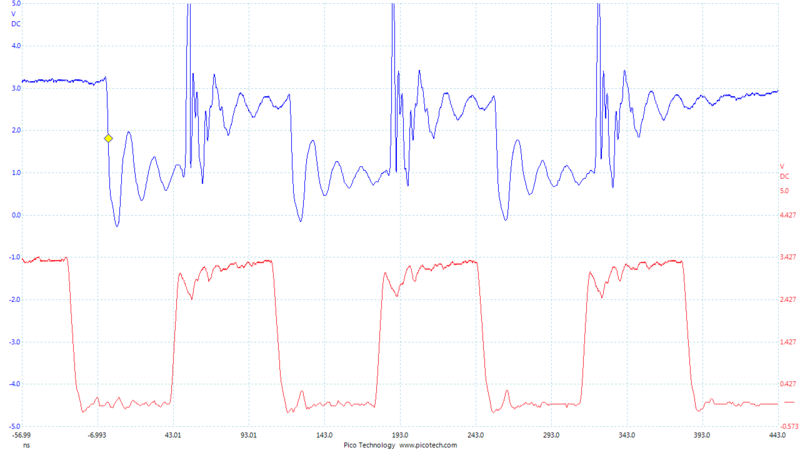 Note you should only adjust the 'frequency' portion of this, if you highlight the entire field you may not be able to type the frequency into the system. Confirm the DCM Locked checkbox is checked, if not hit the Reset CLKGEN DCM box. Check the Freq Counter to ensure the system is correctly generating about a 7.37 MHz clock. For the ChipWhisperer-Lite (CW1173/CW1180), set Target HS IO-Out option to CLKGEN. For the ChipWhisperer-Capture Rev 2 (CW1002), set Target HS IO-Out option to Glitch Module. The baud rate for this system is 38400, which should be the default for the ChipWhisperer serial port. 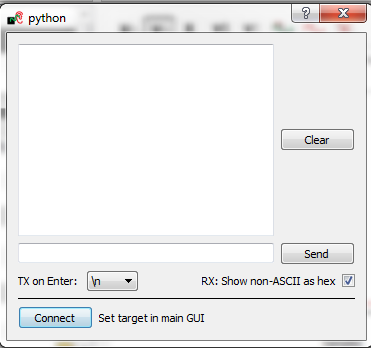 Program the .hex file into the target. When programming the AVR, it needs a working clock source before the programming will succeed. Now that this is enabled, you can use the appropriate programmer (such as the AVR or XMEGA programming from the Tools menu if using a CW-Lite) to program the hex file. You should see the "Hello" message printed on the terminal emulator window. Releases of the ChipWhisperer-Capture software prior to 0.13 had a bug in the AVR reset logic, which never released the device from reset. You must update your ChipWhisperer-Capture release in order to complete this tutorial. For ChipWhisperer-Lite (CW1173/CW1180), select "Reset AVR/XMEGA via CW-Lite"
For ChipWhisperer-Capture Rev 2, select "Reset AVR via ISP-MKII"
Switch to the Aux Settings tab. Depending on your module you will see different settings here, for example the ChipWhisperer-Lite lets you select between AVR and XMEGA targets. This normally defaults to the "XMEGA" device, so be sure to switch this to the "AVR" device if using the NOTDuino or Multi-Target boards! Press the Test Reset button in the Aux Settings tab. This should reset the AVR target. Confirm this by monitoring the terminal emulator window, and check the startup message (of "hello") is printed again. You can also use the "Reset" button on the NOTDuino to confirm the startup message is printed. Switch to the Target Settings tab, and remove all the text in the Load Key Command, Go Command, and Output Format fields. Switch to the Scope Settings tab. Switch the ADC Clock Source as being CLKGEN x4. Press Reset ADC DCM, confirm the frequency is 29.5 MHz as expected. Switch the Gain Setting --> Setting to be 40. You might need to adjust this for different hardware. If this does't work: check the trigger in use is the Target IO4 pin. We'll now look at glitching this routine. As before after sending the A the system goes into an infinite loop, and sends 1234 after exiting from the loop. Using VCC glitching we'll escape from this loop! Rather than using the manual trigger, we'll jump right into using the Glitch Explorer to break this target. First, we'll setup some basic glitch parameters for your specific target. Switch to the Target Settings tab, and set the Output Format to $GLITCH$. Open the Glitch Explorer, and hit Capture 1 a few times. Confirm this populates the table with various examples. You can test the updated color-coding seems to be working too with a few Capture 1 events. Finally, let's configure the Glitch Explorer to give us the required sweep of the Offset parameter. Adjust the Glitch Offset (as % of period) up or down by 1 in the Glitch Module settings. We do this only to get the required string printed to the Script Commands output. Set the Tuning Parameters to 1 in the Glitch Explorer. Ensure the Trace Format is set to None (i.e., no traces will be written to disk). 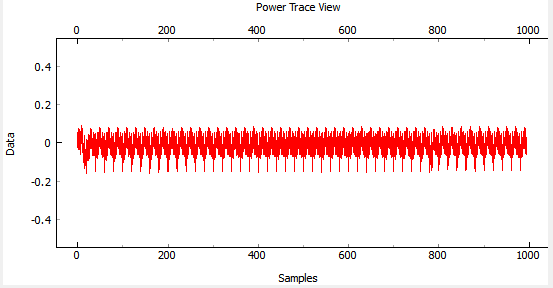 Set the Number of Traces to 200. Press the Capture Multi button. You will get a warning as there is no trace writer, but can just hit Continue Anyway, since we do not want to store traces to disk. 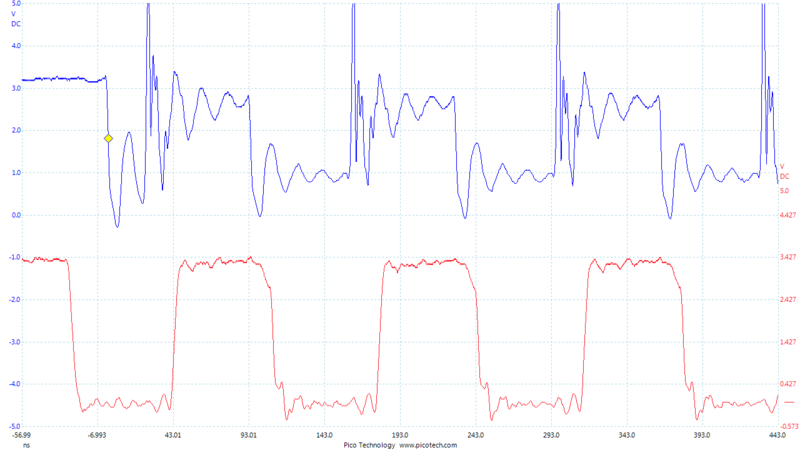 Try reducing the Repeat parameter in the Glitch Module settings. See how few cycles you can glitch while still achieving a reliable glitch. Once you have the glitch parameter determined, you can work on trying to recreate some of the previous tutorials such as glitching passed the password prompt. It is also possible to glitch more advanced targets, such as the Raspberry Pi development board! This requires some additional hardware setup which will be discussed here. The Raspberry Pi is a small ARM-based computer that runs Linux. This tutorial will show you how to influence a program running in userland via voltage glitching. 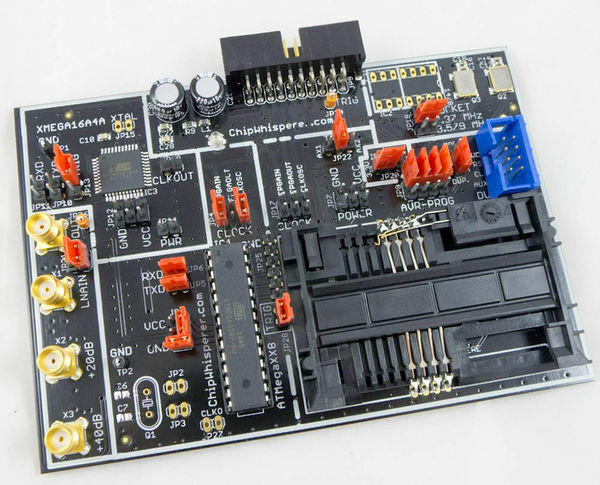 We will use the ChipWhisperer-Lite board, as it has integrated high-power glitching MOSFET. This tutorial can cause permanent damage to your Raspberry Pi board. The generation of glitches means driving the power supply and device beyond limits specified in the absolute maximum ratings. Only perform this tutorial if you are not too attached to your Raspberry Pi board. YOU PERFORM THIS TUTORIAL AT YOUR OWN RISK. NEWAE TECHNOLOGY INC. IS NOT RESPONSIBLE FOR DAMAGE CAUSED BY FOLLOWING THIS TUTORIAL. And then solder a wire onto the VCC side of a decoupling capacitor, such as C65. 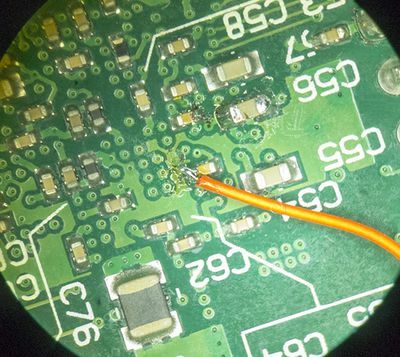 Check the polarity with a DMM to ensure you have the positive side and solder a fine wire to it. We will now mount a connector so we can connect this to the ChipWhisperer-Lite Glitch port. 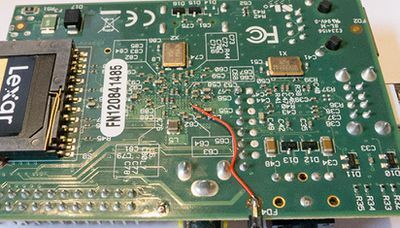 This will require you to check your specific revision - on this board an empty hole (test point) labeled "TP2" connects to ground, and made a handy location to connect the SMA connector to ground. 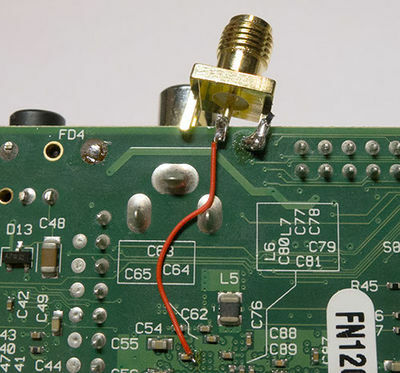 The positive side of the capacitor connects to the inner conductor of the SMA "GLITCH" port, and connect the outer connector to ground on the Raspberry Pi. At this point do not yet plug into the GLITCH port, we will do that once setup is complete. Finally you need to boot the Raspberry Pi and connect to it. This is suggested to be done with a SSH shell over the Ethernet connection, as the Ethernet connection typically has very good protection against voltage transients. If you connect the Raspberry Pi to a monitor over HDMI, there is a chance the glitches may cause invalid voltage levels on the HDMI port which could damage your monitor. The output is split into two parts. 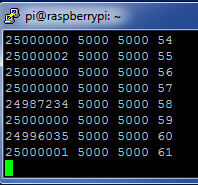 The first three are used to monitor the glitch insertion (this is the 25000000 5000 5000, the second makes it easier for you to confirm if the Raspberry Pi has crashed. Now that you have a working system - let's break it! 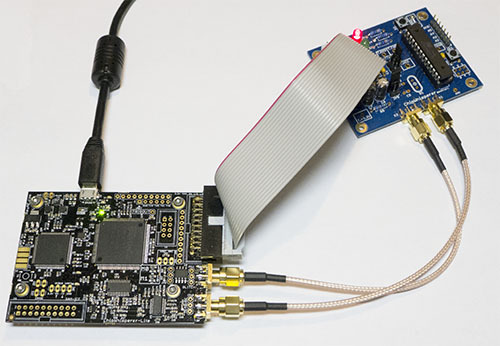 Set the Scope Module to ChipWhisperer/OpenADC, and the connection to ChipWhisperer-Lite. Hit the Scope Connect button. There is no target for this example. Set the CLKGEN frequency to 120 MHz. Set the Glitch module Source to CLKGEN. Set the Glitch Mode to Enable Only. Ensure the Glitch Trigger is Manual. Set the Repeat to 38. Click the HS-Glitch Out Enable (High Power) check-box. Connect the SMA cable for the glitch output to the Raspberry Pi. With the output of the glitch program running, hit the Manual Trigger button. This will cause a glitch to be inserted, and observe the output of your glitch program. Most likely the glitch width was insufficient for a glitch to be inserted, so increase the Repeat count to increase the width, and try pressing the Manual Trigger button again. In this example a glitch was successfully inserted with a width of 52, so you might want to try a few larger numbers. If you do things wrong your Raspberry Pi will crash and you'll need to reboot it and continue experimenting.